Tuesday marked the 67th anniversary of the day Jackie Robinson stood at first base for the Brooklyn Dodgers, breaking the color barrier in Major League Baseball on April 15, 1947. His bravery, determination and talent ended racial segregation in baseball and paved the way for many African-American greats to come. Born January 31, 1919, in Cairo, Georgia, Jackie Robinson became the first black player in the major leagues in 1947, signing with the Brooklyn Dodgers. Throughout his decade-long career with the Dodgers, Robinson made advancements in the cause of civil rights for black athletes. In 1955, he helped the Dodgers win the World Series. He retired in 1957 with a career batting average of .311. Robinson died in Connecticut in 1972. Due to his incredible courage and strength, Hall of Fame second baseman Jackie Robinson officially broke baseball’s color barrier when he became the first African-American to play in the MLB. Making his first appearance with the Brooklyn Dodgers on April 15, 1947, the Cairo, Georgia native made a lasting impact on Major League Baseball and the game as a whole since he was able to help people overcome the hardships of segregation. Though many did not accept Robinson’s entry into the professional arena right away, multiple Dodger teammates — including team owner Branch Rickey — remained alongside Robinson throughout his 10 seasons with the ball club. After beginning his professional career with the Kansas City Monarchs of theNegro Leagues, Robinson was invited to play with the Montreal Royals, the minor league affiliate of the Brooklyn Dodgers. Upon succeeding with the Canadian club, Robinson was called up to the big league squad where he was strong from the beginning. 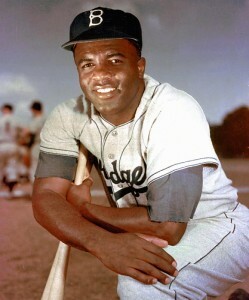 A six-time All-Star, Robinson was also voted the 1947 MLB Rookie of the Year and the 1949 National League Most Valuable Player. In addition to those feats, the career .311 hitter won the National League Batting Title in 1949.